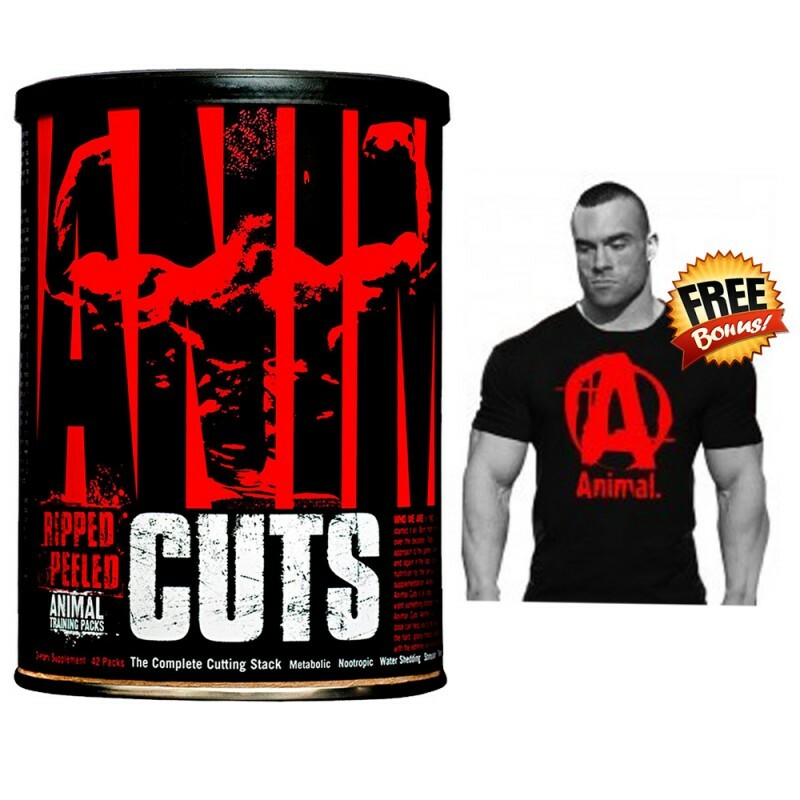 Universal Nutrition Cuts + Free Authentic Universal Nutrition Tee! Get Pak and you'll receive this original shirt featuring the "Fury" Icon which is comfortable and durable to wear on your training. Available is Large size. Cuts by Universal Nutrition is a potent fat burning supplement in capsule form. Cuts is a complete fat shredding formula which was designed specifically for competitive bodybuilders, and serious athletes. Maximum effect, shedding excess water and creating a hardness like never before for maximum muscle striations and definition. Thermogenic Complex: The main fat burning standouts here are caffeine,yerba mate and raspberry keytones. Proven results for stimulating your metabolism. A faster metabolism means more calories burned. This translates into more fat burning potential over time. This also has a strong anti-oxidant effect. Metabolic Complex: A collection of tea extracts. Again these are great metabolism stimulators. They also provide a good source of natural caffeine for smooth,long lasting energy. Thyroid Complex: Thyroid regulates leptin and metabolic rate. Keeping it in check with help keep your fat burning on track. Diuretic Complex: Shed excess water for a leaner,drier look in just days. This will keep you looking tighter,especially around the abs and lower back. Cortisol Inhibiting Complex: This uses ashwanganda extract which has been proven to be effective at keeping cortisol under control. Cortisol is a very catabolic hormone. This is your worst enemy when it comes to building muscle and burning body fat. Cuts by Universal Nutrition is very complete and attacks fat burning from all angles. Proven ingredients and intelligent dosing for effective results-fast. For maximum results take 1 pack of Cuts 2 x per day (morning and early afternoon) for 3 weeks. Team RockHard Supplements recommend starting out at one pack per day to asses tolerance at first. To support fat loss this is ideal to be stacked acetyl l-carnitine such as RHS Pure Acetyl L-Carnitine. This is a powerful fat metaboliser and stacks perfectly with Cuts.